All around are signs of past lives; graves in the shape of wool sacks, an 18th water pump (although ale was preferable), window openings at unhelpful heights and a red lion above a lintel where a pub used to be. Amersham is a modern Chilterns market town once again under pressure from the onward march of progress and development. Renowned for its Christian martyrs burned for their beliefs, successful black lace industry and perhaps on a more frivolous note, a perfumery, this is a town of two halves: the modern town on the hill and its medieval twin in the valley below. The Misbourne Valley in the central Chilterns is a delight. Dotted with woodlands, pretty villages and market towns, this once quiet corner of the Roman Empire is now a busy Metroland corridor, linking London highways with Chilterns byways. 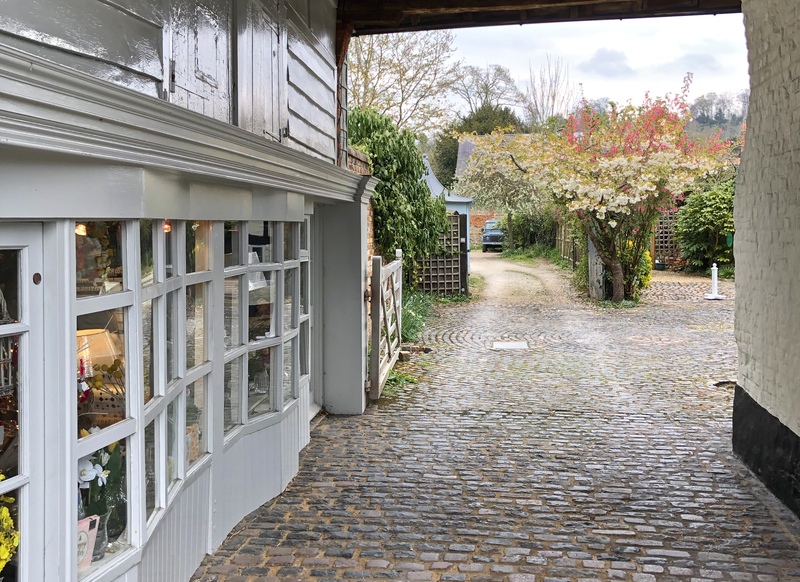 A mere 25 minutes from London on the Met line, Amersham offers train-to-trail countryside escapes, and space to breath. Served by the Metropolitan Railway, Metroland was the name given to the suburban areas that were built to the north-west of London. Once the centre for black lace production, 16th century craftswomen specialised in fine silk veils and wide flounces of black lace that were used to decorate white dresses. In fact the industry continued late into the 19th century because almost everyone, from kings to babies at one time, wore lace on their clothing! Another industry synonymous with the town was the Goya perfume factory, that supplied large qualities of fragrances and perfumes to women after the Second World War. I wonder what the town smelt like? The Amersham Martyrs were called Lollards, who demanded to read the bible in English. There are two parts to this pretty town; medieval Amersham with its unusually spacious high street, and the new town and railway station. This came about because the town fathers didn’t want a railway mucking up their medieval streets in the 1890’s, and insisted it be routed 20 minutes away up the hill. And now, 130 years later, the town is once again facing pressure and change from another huge railway project; this time from HS2, that will thunder right through this peaceful valley, changing it in ways we don’t yet know. I have written about it in another article called Evolving Landscapes. Go with a guide! You simply turn up at the museum to join a tour at 2.30pm on a Sunday. As I waited, numbers grew to include a couple from London on a weekend break, the leader of the Amersham Band and a couple who were mysteriously ‘just passing through’. My companions on this town tour with Euan, volunteer guide and purveyor of intriguing Amersham insights and stories. We began our tour in the museum garden, filled with herbs and plants our medieval ancestors would be familiar with, to help them get through life without a GP, or symptoms to Google. Being on the poor side of the high street, this garden would have been considered small. The houses to the other side of the high street in comparison, still have substantial plots. This garden is bordered on one side by typical knapped Chilterns flint and brick almshouses, and a discreet long-drop privy overhanging the river Misbourne. The museum itself is situated within a 15th century structure that has over the centuries, undergone many changes. It charts the towns story through the voices of past residents who lived and worked in the many industries and local trades, the great and the not-so, including those mentioned above. Thanks to a substantial restoration project, the beautiful medieval and Tudor floors and wobbly beams (made from green oak) are revealed. If I’d have had more time, I’d be trying on all those Tudor dresses! A typical Chilterns chalk stream, the Misbourne (missing stream), meanders through the centre of town, behind houses, through a meadow and under a lot of bridges. The current low water level attests to the temperament of this stream, following as it does, the variations in the annual rainfall. It is still known to flood however, with memories fresh after the last sandbag event, despite the river being confined to a narrow channel. You may be familiar with the Kings Arms hotel, a former posting inn, made famous by the 1994 British romantic comedy ‘Four Weddings and a Funeral’. The inn served as a place to change the horses on the London to Oxford route, and perhaps give the weary travellers some respite after 25 miles along bumpy roads from London, and quite possibly with another 30 miles onwards to Oxford to endure. It looks quaint and olde-worlde, but the majority of the facade is in fact ‘Brewery Tudor’ that was added by the local brewery about 100 years ago to cover up an unsightly earlier facade. It seems there was a lot of this about with false frontages been added by successive owners to modernise their old fashioned structures. So common was the practice it’s difficult to know where medieval stops and Georgian begins. It is the equivalent today of stripping out the kitchen to make way for ‘open plan’ living. There are several notable examples of grand houses built with a former industry in mind, but now repurposed for other lives. Many of them have tell-tale features and locations, and the guess-work is fun. The houses of the most important people in town: the coopers house, and to the right, the brewery managers house. The Market Hall, a Grade II listed building that was built in 1682 by Sir William Drake as a gift for the town, is not hard to miss. Commanding the most prominent spot on the high street, it was intended for the upper floor to be used for meetings for traders’ guilds, and the ground floor as a market and lock-up for miscreants. The coldest room in the coldest corner of the market awaited those who fell foul of the law. All around are signs of past lives; graves in the shape of wool sacks, despite this never being a wool town, St Mary’s resplendent in excavated flints from the new railway, an 18th water pump (although ale was preferable), window openings at varying unhelpful heights in the building that was the water mill, a red lion above a lintel, where a pub used to be, the maltings, a stable for the brewery dray horses and a parapet blocking out light to the servants’ rooms following some fashionable structural updates. There is great hope in Amersham for facing down disruption and continued changes to their way of life. A thoroughly modern town doing things their way, which bodes well for residents and businesses to thrive and continue to be an example of how towns adapt, yet still retain their historical roots and proud Chilterns heritage. This article doesn’t do the town justice; visit and enjoy the independent shops, restaurants and pubs along the high street with not a chain store in sight. But do start with a browse around the exhibits at the wonderful Amersham Museum, join a town or martyrs walking tour available on Sunday afternoons from April to September. Amersham has a number of Alms Houses that add to the great variety across the Chilterns. Not least of all the Drake Houses on the high street, originally built to house six local widows. You will find the martyrs memorial either along a footpath leading from St. Mary’s Church, or from an overgrown footpath from Station Road. 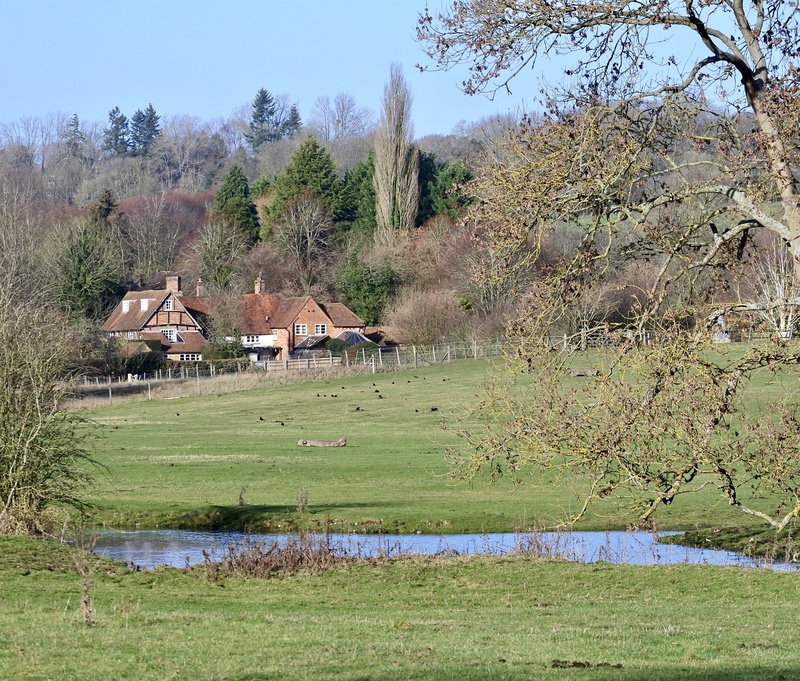 You can explore the Misbourne Valley and the village of Little Missenden. This place is a time capsule, overlapping function and forms across seven or more centuries – from the 14th century to the present day. Sir John could never have imaged 600 years ago what would be at the bottom of his formal garden, no more than we can imagine what will be at the end of Luton Airport runway in another 600 years. Sir John Wenlock could never have imagined 600 years ago what would be at the bottom of his formal garden, no more than we can imagine what will be at the end of Luton Airport runway in another 600 years. The lanes in Bedfordshire are terrible; even the potholes have potholes, fly-tipping and dangerous driving made for a slow journey down ever smaller lanes. Carefully following dusty brown signs to the scheduled ancient monument, my lunch flew across the front seat and splattered on the floor as I braked to avoid a collision with a speeding white van, summer hedgerow too high to see more than 10 yards ahead. Why am I here, at the end of dusty lane on the edge of a runway? To look at a mystery wrapped up within an enigma: the scheduled ancient monument Someries Castle, which is not in fact a castle, but a fortified Manor House. But I’m not fussy! I had no idea where I was until a control tower came into view amongst a row of oak trees quickly followed by the whine of an aircraft engine and an orange tail fin moving rapidly across the edge of a wheat field. Luton airport occupies an enviable hill-top location, with roughly a 130 ft drop at the western end of the runway. Following the end of WW2, when it was used as a base for the RAF fighters the land was returned to the local council, which continued activity at the airport as a commercial operation. Now a busy international airport, it is hard to imagine the impact this had when it opened in 1938. Mind you, there was no EasyJet or Whizz Air flights taking off and landing every few minutes. Someries Castle was built in the 15th century by Sir John Wenlock, soldier, local MP, diplomat, statesman and one time High Sheriff of Bedfordshire and Buckinghamshire, this unremarkable structure’s claim to fame is as one of the first brick buildings in England. The house was never completed by Wenlock, and was partly demolished in the 18th century leaving the remains of the gatehouse that incorporates the lodge and a chapel too. The original manor house and/or the earlier Norman Castle are now visible only as earthworks that outline the plot where the house originally stood, but not accessible as the site is tightly enclosed by 6 foot railings that are either designed to keep the locals out or visitors in. The palace was never completed, although an inventory of 1606 lists 20 rooms in use. Much of the building was pulled down in 1742 and subsequent 18th-century prints show the ruins largely in their present condition. Historic England refers to this structure as a palace, that would have functioned as luxury residences for the elite and their large retinues, and provided an opportunity to display wealth in the form of elaborate architecture and lavish decoration. These palaces formed an impressive setting for audiences with royalty, foreign ambassadors and other lords and bishops and it’s not unusual to find them in remote rural settings. Sir John Wenlock – did he or didn’t he? The site and builder are a mystery. There are survival theories aplenty; that he did not die in the field at Tewkesbury, but faked his own death (and with the help of his wife, buried another corpse in his place), that his ghost still lurks around the gatehouse, that he was a consummate fence-sitter and switched allegiance many times during the War of the Roses, that he built a system of tunnels beneath this structure, that he left a cup of gold and a chest stuffed with jewels under the care of the abbot of Glastonbury, and so it goes on. 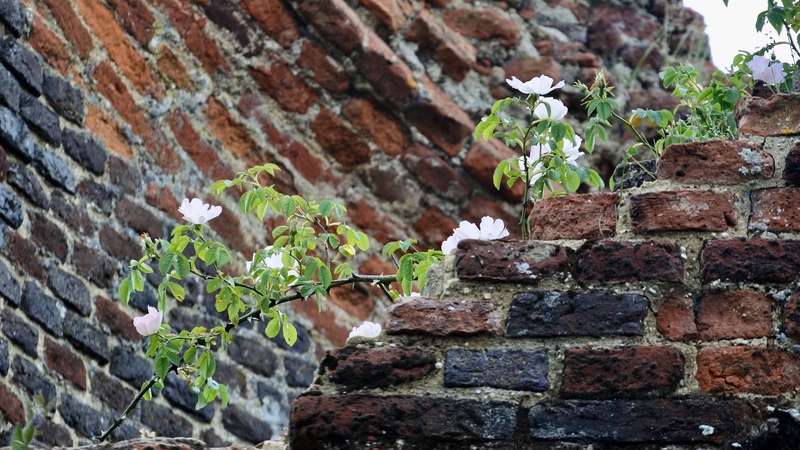 Some of the brickwork is damaged, and there is extensive graffiti on the interior walls, but the poppies and dog roses growing wild are lovely. Someone had been in to cut the grass, and the longer I looked, and looked past the obvious damage, there are many delightful details, not least of all the remains of a splendid 15th brick-built newel staircase leading your eyes up the ruined steps that once supported a spiralling barrel-vault. I don’t like aspic. It impairs flavours, encases and suspends the contents so it’s difficult to get a good look at what’s inside. So it can be with the English countryside: often described as ‘chocolate box’ which to me says ‘sentimental and twee’, and doesn’t represent anything that resembles reality after the 1930’s. This place is a time capsule, overlapping function and forms across seven or more centuries, from the 14th century to the present day shows the many uses of the land. Past, present and future. Sir John could never have imaged 600 years ago what would be at the bottom of his formal garden, no more than we can imagine what will be at the end of Luton Airport runway in another 600 years. This working landscape doesn’t appear to have the time nor space for leisure visitors, surrounding fields and farmhouses, airport, railway and motorways all press in on this space. I’m surprised Someries Castle has survived as long as it has. This pressure between agriculture, an expanding aviation industry and Chilterns heritage is quite stark. It is not conventionally pretty, unlike the space surrounding the market town of Marlow where I was the day before, yet to have such a cross section within our region is refreshing. I am no plane-spotter, but stood awhile watching the aircraft taking off from Luton Airport, oblivious I expect to their immediate surroundings and Chilterns heritage and wider story, focused instead on their destination. I like a busy landscape, with butterflies and bugs, locals and visitors, and agriculture and hard-edges of industry. It means the landscape is alive and the story of the Chilterns is still unfolding. Joseph Conrad lived from 1907 – 09 in the neighbouring farmhouse whilst writing his bestselling novel Under Western Eyes. Another neglected scheduled ancient Chilterns monument is Berkhamsted Castle. “Peter, the Wild Man from Hanover. Whoever will bring him to Mr Fenn at Berkhamsted, Hertfordshire, shall be paid for their trouble’. Why are some people remembered whilst countless others never will be? Is it noble birth or notoriety? Or do memories attach themselves along the often invisible threads that bind and weave together the history and stories of the Chilterns, making it the special place it is today? It is after all, the people and places who shape and are shaped by their location that determine its history. This is the second instalment of the fascinating story of Peter, one time resident of Northchurch who lived until he was around 70 years, but the label ‘Wild Boy’ has stuck. 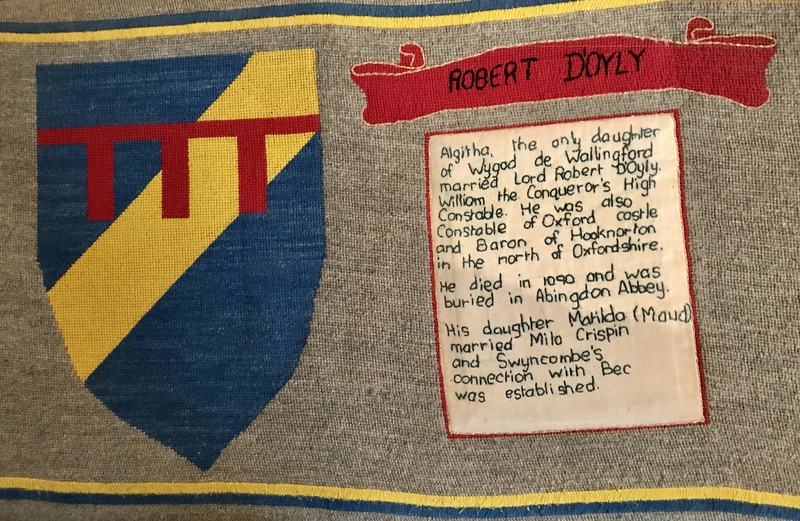 You can read about his life in this earlier blog post, and following a visit to Berkhamsted School, what I found there warrants further telling of his story. Typically, historical events are remembered, celebrated even, by those on the winning side, so why, I wonder is Peter still remembered? His whole life was tenuous, he had no connections, no skills, no way to communicate, no family nor children and he lived by his wits and kindness of strangers. When he was found as a boy, it is said that the only remnants of a ‘civilised’ life where the remains of his shirt collar, which ironically, it is now a collar by which he best remembered: the collar that was crafted for him to wear to ensure that if he wandered off, he would be returned to his home at Fenn Farm. I was surprised at how small the collar is, and don’t believe it was worn by Peter as an adult. Perhaps as a man, his wondering days were behind him? “Peter, the Wild Man from Hanover. Whoever will bring him to Mr Fenn at Berkhamsted, Hertfordshire, shall be paid for their trouble’. I believe one shilling was the reward. By our values, this may seem cruel to put a collar on a human, but to me, it must have been an act of kindness and concern for his safekeeping, especially after his epic 100-mile solo adventure to Norwich, where after being jailed, it took some time to return him home to Northchurch. It was because of his wonderings that the king was petitioned for an increase in the £30 annual pension granted for the maintenance of Peter, in view of the expense of advertising for and organising his return when he wandered far from home. It is not recorded if the petition was successful. The Crown paid Peter’s pension until his death in 1785. Peter was five feet two inches tall and apart from the webbing between two of his fingers, there was nothing to indicate that he suffered from the rare genetic disorder known as Pitt-Hopkins Syndrome. I love that a wax effigy was made of him that would be viewed in a wax museum on the Strand in London – pre Marie Tussaud’s as she only set up her first permanent waxworks in 1835. It is not clear exactly how the collar ended up in the school archive along with the above mentioned petition and other items, but it could have been as a result of the Brownlow family estate being broken up and the items given to the school for safe custody. Peter’s collar returned to the Royal court for a year in 2014 when it was loaned to Kensington Palace to be included in their ‘Glorious George’s Exhibition’ and Lucy Worsley, historian, broadcaster and curator took a keen interest in Peter and visited the school and his grave site at St Mary’s church. I expect there was pressure to keep the artefact at the Palace, but am delighted it is back where it belongs, in the Chilterns. It is thanks to those at the bottom of the pile, who should be given just as much airtime as those at the top, for it is the former upon whom the latter builds power and status, but that doesn’t make their contribution any less. This is a unique story, of a man who survived against the odds, and it was this notoriety that has ensured his memory is alive and well. To those who still leave flowers on Peter’s grave, I salute you! I would like to thank Lesley Koulouris, archivist at Berkhamsted School who was very generous with her time and vast knowledge and who gave permission to reproduce these items included above. Berkhamsted school is to the rear of St Peter’s Church, on Castle street, Berkhamsted. Berkhamsted school participates in the Heritage Open Days festival in September each year, and the school opens the chapel and ‘Old Hall’, both worth exploring. For further Chilterns inspiration and ideas. In places the original iron fence has been replaced by wood, then barbed wire simply rolled over the gaps that will keep everything out. Or in. The contrast between the carefully managed fields and the disarray and upheaval behind me couldn’t be greater. The former almost lifeless, the latter bursting with life. I love the wide open winter vistas that reveal unexpected views and spaces, the shadows long, and a raw winter wind causes the bare tree tops to clatter and scratch against one another, loud on the otherwise still hillside. What looked like the aftermath of a great disturbance with piles of flint, up-ended trees, mounds of excavated chalk and the biggest wall of roots I’d ever seen awaited us as we headed off-piste to follow the animal trails that branch off the well-trodden Ashridge Forest Sunday paths. 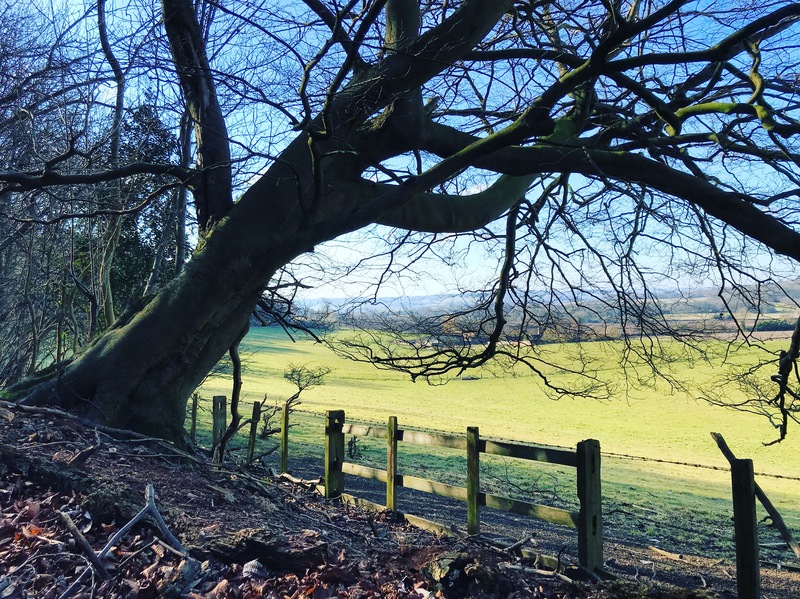 The Ashridge estate is huge, with over 5,000 acres of woodlands and the many visitors tending to huddle near the toilets, cafe and carpark, the chances are always good you’ll have the other 4,999 acres pretty much to yourself. Heading downhill through the trees, it’s only as the track became even narrower and I have to watch where I am walking, that I notice the toppled trees interspersed with tightly-packed new growth, enjoying a few years of space before they are muscled out. These upended beeches, all pointing uphill, whilst the oaks, needing space have jumped the fence and taken root in the field alongside. This scene of furious activity by nature’s hand, not human, looks surreal; big pieces of scattered flint, stones, numerous piles of chalk excavated by badgers as they enlarge their extensive hillside homes, even trees turning to dust. The leaf litter is still thick, and covers ankle-twisting holes and rocks, and still the barely visible track leads on along the edge of the tree line, very straight, there is no mistaking the intention of this boundary. In places the original iron fence has been replaced by wood, then barbed wire simply rolled over the gaps that will keep everything out. Or in. The contrast between the carefully managed fields and the disarray and upheaval behind me couldn’t be greater. The former almost lifeless, the latter bursting with life. Wide open winter vistas revealing the unexpected view back down the valley rising up to Wiggington and Wendover. This seasonal sight will close up, like a theatre curtain draws over the view as the trees spring back into life. A crow hangs lazily on the wind. The dog is spooked by something, so scrambles onto a log, growling and begins to bark. Having dull senses, I cannot hear nor smell as he can, when suddenly, the hillside comes alive as a small herd of deer crash through the trees, in flight from an excited barking dog, The deer however, have the upper hand, they know all the tracks and escape routes and they sweep past us, twice. I bet they know this is a Sunday morning, their least favourite day of the week! Next up on the weirdness scale, a wall of roots and stones, at least 10 foot in circumference, that shields a well-trampled clearing, a good spot for the deer? What forces were at work to upend such a large tree, revealing this stoney underworld apron? The aerated soil is crunchy underfoot, a mix of pebbles, beechnuts, and twigs. We pass a large saw pit, criss-crossed with bike tracks as we follow a well-used single track uphill. The vegetation on this sunny slope quickly changes from the stark to timid signs of the first primroses and what will be another grand display of bluebells in April or May, as their tiny leaves break through the leaf cover. Do trees only fall uphill? From my unscientific study, I’d say yes they do. However, I was delighted to see that here and there, rebel trees had thrown themselves onto the fence downhill, in some places crushing it flat beneath their weight. Result! Voices carry on the wind and I know it’s time to head home. Get to know the ghosts, they all have a story to tell. Get to know the ghosts, they have a story to tell. Up and down the land, there are ‘something for everyone’ high streets, towns, heritage parks, historic houses, districts and destinations. What if you could tell your community and networks the story of your local area? As interpreted by you? Seen through your eyes? The only rules are the celebration of the magnificent and mundane, remembering that what is incidental detail to you, will be new and refreshing to someone else. It’s what sets a place apart from all the rest, it helps customers make decisions about where to visit as your location becomes distinctive and intriguing. I have put together my first A to Z of the Chilterns, which wasn’t easy, there is simply too much information to include. A is for Amersham Museum, Aldbury Nowers and the Adonis Blue.. This will, without a doubt, change and evolve, as I add more columns, fill it with images and the names of things still to be discovered. I have plans for posters. Why not give it a go? If you do, please let me know as would love to share it. Social media are the new jungle drums; informing and directing seasonal excursions, news and sightings of what is in bloom, and where. So it was that I headed off seeking the pleasure of carpets of snowdrops in the grounds of the tiny parish church of Saint Botolph at Swyncombe. Poking around in unassuming, tucked-away local parish churches, so often reveal remarkable links with the nations story, told in place names, headstones and the tombs of those buried there. February is the time to satisfy seasonal cravings for warmth, sunshine or a dash of colour in an otherwise challenging month. Carpets of aconites and snowdrops start off the race to spring, hellebores and daffodils in hot pursuit, with the ultimate spectacle of the iconic bluebells that light up the woodlands from April to May that will herald long overdue summer days. Social media are the new jungle drums; informing and directing with seasonal excursions, news and sightings of what is in bloom and where. So it was that I headed off seeking the pleasure of carpets of snowdrops in the grounds of the tiny parish church of Saint Botolph at Swyncombe. Travelling north to south and back again is easy to do, the challenge is crossing from west to east as there is no direct route. Therein lies the joy of Chilterns travel: unhurried, with the slight edge of not really knowing where you are, glimpses of the road ahead not really helpful as their unfamiliarity only confirms my sense of trepidation, when all of sudden, the bare tree canopy opens up revealing wonderful views down the valley as I watched an approaching rain shower racing towards me. I followed a succession of narrow windy lanes, thick mud and leaf litter piled up on either side, making me glad I was visiting mid-week, so wouldn’t have to negotiate these mires with other road users travelling in the opposite direction. I now understood why this area has been called the ‘desert of the Chilterns’, it is remote, despite being so close to London and nearby market towns of Wallingford and Henley on Thames. I turned off the track, following signs for the Norman parish church, and apart from a photographer with an enormous zoom lense, there wasn’t anyone about. I was underwhelmed with the snowdrop display, the aconites were much prettier and were working hard to cheer up a gloomy corner of the graveyard. The church itself is small, unassuming and gives no hint at what is inside. Poking around in tucked-away local parish churches, so often reveal remarkable links with the nations story, told in place names, headstones and the tombs of those buried there. This church is a Norman Pilgrim Church, a reference to it’s place on a Pilgrims route, a once popular undertaking. St. Botolph was one of the earliest and most revered of East Anglian saints, and became known as the patron saint of wayfarers. A Saxon noble who lived in the 7th century, he spent time abroad and upon his return was given, by King Anna, a grant of land near either Aldeburgh in Suffolk, or Boston in Lincolnshire to build a monastery. 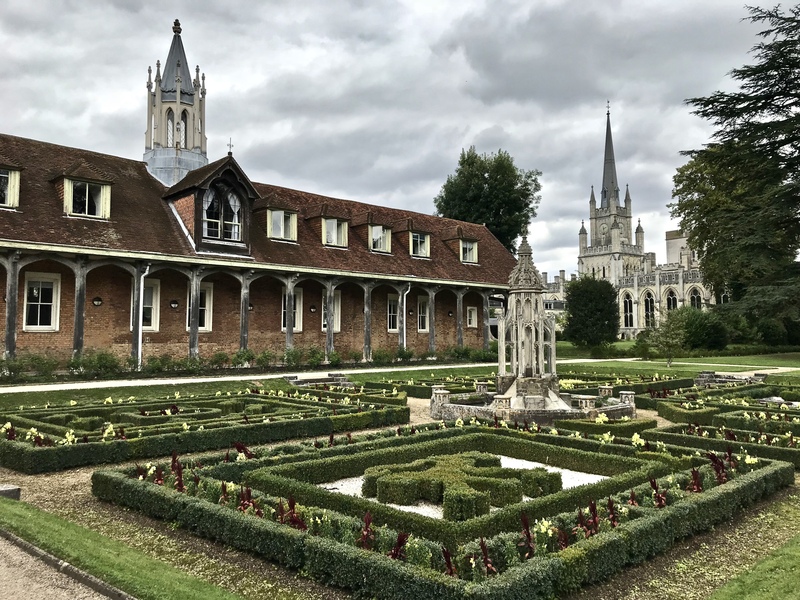 Two centuries later in around 870, it was destroyed by Danish invaders and the saint’s remains were divided into three parts and taken from the ruins to be housed in Ely and Westminster Abbey. It is likely, given the flourishing trade in relics at the time, that the parts were conveyed from place to place and so his name became synonymous with wayfarers and travellers. Over 70 Churches, along with five towns and villages are dedicated to him, and although he has no place in the Prayer Book Calendar, his feast day is June 17. Not many parish churches are open to the casual visitor, so I am never sure if the sturdy doors will yield when pushed. This one did, and opened into the warm and colourful interior that far surpassed the seasonal exterior. Some hikers were eating their sandwiches in the back pews and returned to their murmurings beside the font. Although extensively restored in 1850, much of the original Norman church is recognisable, with the font that possibly predates even this. 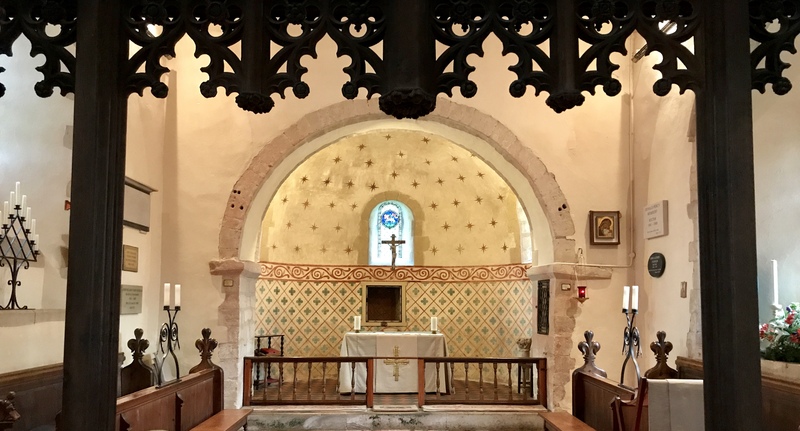 The ceiling has been restored and is painted a summer blue with a more brooding red reserved for the Norman apse, off set by simple white walls and red floor tiles, some looked medieval. The rood screen and loft date from the early 20th century. The refurbished wall paintings behind the alter are impressive and make for a cheerful and pleasant space. The wall plaques commemorating former vicars, wardens and parishioners remind me that I am in England, not in some far off exotic place. No sign of any relics, but I am delighted that this special place, tucked away in this ‘green desert’ that involves a purposeful journey is named after the English patron saint of wayfarers and travellers. It means even more to me now.